Deciding to start a company is a truly difficult decision. There are so many different things that go into making this decision. You have your personal life to consider. You need to determine how you will make your business successful. Ultimately, you will need to make sure that the potential reward outweighs the inherent risk you are taking. Many budding entrepreneurs stop short of starting because they start second-guessing their decision to start a business. Second guessing yourself leads you to make excuses. You start telling yourself to forget about becoming a business owner altogether. Think of all the bad things that could happen. You start to convince yourself that you are just not ready to become an entrepreneur. You believe that giving up your dreams is the best decision to make. But how long will it be before you start to regret your decision? You are probably afraid of failing, which is understandable. No one wants to experience failure. But that does not mean that you forgo taking a risk that could ultimately change your life. Each time you put off becoming an entrepreneur, someone else in the world takes that same risk and enjoys the fruits of their labor. You cannot possibly believe that you will reach your full potential being an employee. You have the burning desire to do more with your life. Being an employee places a ceiling over your ability to grow and earn money. Entrepreneurship allows you to explore your capabilities and earn much more money while doing so. Unless you work on Wall Street or the next billion-dollar startup, you will not find this same type of opportunity anywhere else. 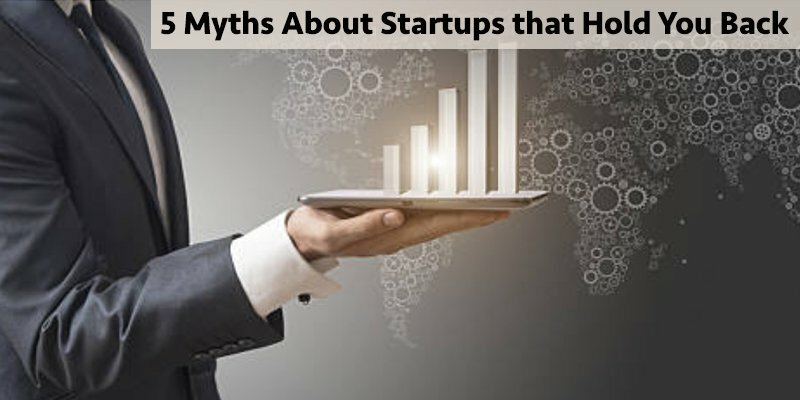 Your problem is that you are letting the myths about creating a startup hold you back. What you are actually doing is searching for the best excuse that will validate your doubts. But you may wake up and see someone who had an idea similar to the one you had for your own business. The only difference has they pursued the business idea, while you gave up before even starting. Now you are angry because you let an opportunity slip away that could have changed your life. The only one you can blame is yourself. You doubted yourself and ultimately failed yourself by doing so. Think about all the inventions that have been created in this world. Some of the products we now enjoy were once deemed as impossible when they were first proposed. Henry Ford was told he could not make an affordable vehicle for the average man. What if the Wright brothers did not believe they could make an airplane? What if Thomas Edison was not so intent on making electricity a viable energy source for people to benefit from? These people could have just quit pursuing their proposed plans due to doubt. But they did not. They did not let themselves be constrained by the opinions of others and their own doubts. They pressed forward because they had goals to accomplish. You really have no good excuse for not starting a business. Stop letting the opinion of others affect your decision. If you are ready to start your company then go for it. If you are questioning some of the common myths about entrepreneurship, we have provided the information to debunk those myths. Continue reading if you would like to learn why these myths are nothing more than excuses. There is no such thing as the right time. If you keep waiting for it, you will never start your business. While you are procrastinating and making excuses, there are others who are moving forward on their ideas and making things happen. You need to start moving if you want to make progress. The longer you wait, the more your opportunity becomes a distant memory. You must remember that other people will have similar ideas that you have. That is why it is important to immediately get in the marketplace so that you can create sales, gain feedback, and improve your business. You are stuck waiting for the perfect time, the perfect product, the perfect partners, when all you really need to do is push yourself out there and learn as you go. This is the advice that successful entrepreneurs will give you. Their motto is to fail immediately so that you can learn how to improve your product or service. No one ever hits a home run on their first product or service. But, as time continues, they learn how their business works and become an expert in their industry. This only happens when they stop waiting for the right time and just go for it. There is no reason why you should be waiting for others to inspire you when your desired success should be your biggest inspiration. Trying to derive your inspiration from others will only leave you feeling empty. The majority of people whom you tell about your business do not care about your success. They do not care about business ownership because they have the mindset of a consumer and not a producer. They will only care about your business if it is benefitting them. You cannot take this as an insult. Start asking yourself what really matters to you about the business – is it the money, the satisfaction of providing a new service or product, the glory of being the best in your industry? Try to visualise yourself living the life of your dreams once your business becomes a wild success. Find out what really motivates you. With internal and self-driven motivation, not external motivation, you will be unfazed by the negativity of others and the occasional obstacles you might face in your road to success. Investors are not necessarily a requirement when you are looking for the best funding options for your business. A bank loan is not a requirement. Bringing on an investor means that you will have to give up equity of your business in order to receive their capital. This is not something you should be doing if you are not creating a company which needs vast amounts of capital quickly to take advantage of an easily replicable service, like many social media platforms. Taking out a loan from a bank means that you now have debt that has to be paid back. So part of every dollar you make now has to also go towards paying back the loan that you have received. Again, you will need to generate a lot of money to offset the cost of having this debt on your company’s finances. It is best to start off by bootstrapping. Small growth leads to a more healthy business because your growth is based upon sales, rather than capital injection. This means that you have a healthy base of customers who support the growth of your business. As you continue to grow organically, you are in a better position to negotiate if you choose to seek outside funding. You can call the shots because you are coming from a position of strength, not from a position of weakness. A formal business plan may not be necessary. Many entrepreneurs create a business plan only to discard it within the first few months of operations. But you will definitely need to have a strategy in place. And whether you like it or not, it’s better for it to be written down in some form. You cannot operate a successful business from just the thoughts in your head. It needs to write down so that you can expand upon them and determine how they will be accomplished. You cannot possibly get anything done by holding everything in your head. When you are just starting your business, your creativity knows no bounds. You have too many ideas running through your mind that you tend to forget after only a few minutes. A strategy allows you to chart your progress, assess what you are doing right and wrong, and pivot your strategy when a different course of action is required. This is how you get things done, instead of wasting your time. You can continue to work your plan and analyze your results – accurately grading yourself on your performance and the results you produce. You should never quit your job if you do not have at least a year’s worth of savings in your bank account to support your living expenses. Additionally, if your business is not currently paying you a salary equal to or greater than your job, you should not quit. If you chose to do so, you will put yourself under a lot of pressure to make your business successful immediately. This will force you to make unnecessary mistakes because you are rushing your process trying to make money to not just support your business, but also support yourself. There is no need to take on this type of pressure when it is not necessary.